Scott Rae: Welcome to the podcast, “Think Biblically: Conversations on Faith and Culture.” I'm Scott Rae, dean of faculty and professor of Christian ethics at Talbot School of Theology, Biola University. Scott Rae: We're here with our guest today, Dr. Craig Hazen, who is the director of the Christian Apologetics program at Biola University and has been for some time. It's a wonderful, growing program that the university has had going for some time. But he's written a book that's not really apologetics related. It shows that he actually knows something about something other than apologetics, which we're encouraged about. But we're here featuring his book Fearless Prayer: Why We Don't Ask and Why We Should. So Craig, thanks so much for coming on with us and telling us a little bit more about the book, and we get to unpack some of the ideas here. Craig Hazen: Yeah, hey, thanks for having me. I love your palatial studio. Scott Rae: You like this, huh? Well listen, every book's got a story behind it. So, what's the story behind this one? What motivated you to write this? Because this is a little bit different than some of the stuff you've traditionally done. Craig Hazen: Yeah, that's a good question. One of my colleagues, I told him I got a contract to write a book on prayer and he just paused. The message was clear, like, "You are writing a book on prayer?" I guess I don't ooze the hyper-spirituality or something. But, I just got bugged by a passage in the gospel of John that I'd read many times before. I'm reading along in John chapter 15 in my comfortable Bible-reading chair at home. I get up early, my kids are ... everybody else sleeps in but me. I'm really annoying in the morning because I'm just full of energy and life. And I'm sitting in my Bible-reading chair and I'm reading along in John 15, and I read this passage in this chapter, in fact one verse really did all the heavy lifting. It says, "If you remain in me and my words remain in you, ask whatever you wish and it will be done for you." So there it is. There it is. It just struck me between the eyes that I don't really believe that. And I'm not sure I know anybody who really believes that either. So that just led me on a path of exploration to find out what did the Lord mean by that. Did he really mean it? Or are there lots of qualifications for that? What's going on there? Sean McDowell: Let's begin really simple and then we're gonna go back to the passage that you raised. So what is prayer? And then what are some common misconceptions you find people have about understanding prayer itself? Craig Hazen: Yeah, in this exploration of the verse, I read a number of books on prayer. And I was actually struck by how many Bible teachers and even scholars had a view of prayer that really didn't include asking, which I found very strange. Sean McDowell: That is odd. Craig Hazen: They thought asking was kind of a low-level spiritual activity. If you have that kind of need, maybe you're not in proper communion with God. Scott Rae: Because you're too self-centered? Scott Rae: So you're actually supposed to transcend asking? Craig Hazen: Yes, that's right. Yeah, some books don't even mention asking. Some, if they mention it, it'll be the last thing on the list, as if it's the lowest rung. I just found that odd because the moment I started actually studying the Bible on what it teaches about prayer, it's like asking to the nth degree. And I've come around to the idea that asking actually puts us in a posture that God really wants us in, more so than other types of spiritual communion with God. It's just fundamental. Sean McDowell: Now you have a whole section of the book why we don't ask and why we should. Is it just theological? Is it practical? Why don't people simply ask if this is such a heart core part of prayer? Craig Hazen: Yeah, there's lots of reasons. Some people I talked to were like, "Well, I don't really wanna bother God." Really? I don't want to bother God, as if he's a single mom with two jobs or something. So, I just found that odd. But strangely, when Jesus is asked by one of his closest followers, "Teach us to pray," what does he do? After he says, "Hallowed be thy name, Father," he goes into a series of asks. It's all about asking; he gives six asks. And so it turns out that that's really at the center of prayer is asking God for things, the felt needs that we have. And let me hit you with this quote, because this is really great stuff. J.I. Packer wrote a book on prayer, which I found very helpful, but he wrote this, "But at the core where all people of prayer bend their knees, prayer is asking, begging God to supply felt needs. In a broad sense, asking is the very essence of praying." And Dallas Willard concurred with that. He wrote, "The picture of prayer that emerges from the life and teachings of Jesus in the Gospels is quite clear. Basically, it is one of asking, requesting things from God." Now, clearly there's a lot more going on in prayer than simply asking God. I spend a lot of time confessing sin and giving thanks and just lamenting and all kinds of things. But it really stokes the conversation, asking, and knowing that he wants us to ask him and he's going to respond. Scott Rae: Yeah, that makes so much sense theologically because it puts us in our proper place in a position of dependence. Craig Hazen: Yeah. And even in the Lord's Prayer, it's, "Give us today our daily bread." It's really, "Give us this day our daily bread," and then you've gotta ask again tomorrow. It's like a constant moment-by-moment dependence on God. Scott Rae: Craig, let me ask you this. I know one of the places where I think asking prayer has been misused is how people ask boldly sometimes for material prosperity, some version of the prosperity gospel. What would you say to that? Craig Hazen: Well, I actually discovered that the problem of the health, wealth and prosperity gospel, sometimes it's called the word-faith movement, sometimes we pejoratively call it “the name it and claim it bunch” or whatever. They've actually had great damage, they've done great damage for the rest of us on interpreting important passages like this. In other words, this passage in John 15:7 where Jesus says, "If you abide in me and my words abide in you, ask for anything and it will be done for you" — that's powerful. But some people say, "Hazen, you've gotta be careful with a passage like that because that's abused by the faith teachers." Well, for goodness sakes, after thinking about it, I'm thinking, "Why would I let them rob me of some amazing promise in the text of the Gospel of John just because they're abusing it? I wanna find out what it really means and get the full spiritual benefit out of that." Let me give you an example of how the prosperity teachers have affected our mindset. So, I wanted to title this new book, and my original title was provocative. It was, "Ask for Anything and You Shall Have It." I just thought that would be in your face. Craig Hazen: And really fun to get people thinking about what that really means. But then the publisher, when we got towards the end of the publication process, the marketing team got on the phone with me and said, "Craig, I'm not sure about that title. 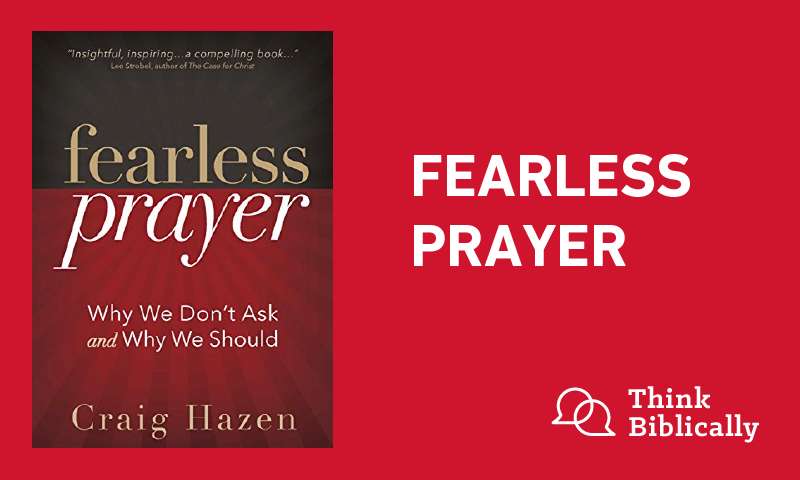 We've been thinking about it and we think this other title 'Fearless Prayer: Why We Don't Ask and Why We Should' is probably a better one." I said, "All right, I'm open to that. That's a pretty good title. But let me do this, let me do a little poll. I've got four or five thousand Facebook friends. So let me put both titles out there, without any commentary, just saying, 'Here's two titles. Which book would you buy? And if you wanna comment, fine.'" So I let this stew for a couple of weeks on the internet, and I finally reaped in the results. And oh my goodness, it was 20 to one against that first title, “Ask For Anything And You Shall Have It.” And almost everybody who commented said, "That sounds like Benny Hin wrote it." And it just showed me that this passage exists in the Gospel of John for all of us faithful believers and yet we're pushing it aside and not giving it much due because it's abused by word-faith teachers. Now, that's a shame. Scott Rae: Okay, so help us understand exactly what's meant by the notion of "Ask boldly for whatever you want," without veering off the rails. Craig Hazen: Well, my exploration actually took me into a series of objections to this passage. And one of them I've just addressed. The word-faith teachers abuse that so we have to be super careful with it. And I just noticed that really plays out in people’s lives. They're tenuous with a passage like this. And they don't jump on it. That was not the case 150 years ago, before the word-faith movement existed. You dial in to the sermons of somebody like Charles Spurgeon. Oh my gosh, he couldn't wait to get to a passage like this because he just found so much life and energy in it. Here, let me read a quote from him that I think will really tell the story. Check this out. Charles Spurgeon, in a sermon, the title of the sermon was called, "Ask and Have." That just seems out there to start with. So in 1882, he preaches the sermon and here's what he says, "Do you know, brothers and sisters, what great things there are to be had for the asking? Have you ever thought of it? Does it not stimulate you to pray fervently? All heaven lies before the grasp of the asking man. All the promises of God are rich and inexhaustible. And their fulfillment is to be had by prayer. Thus you see the Lord's promises have many fulfillments and they're all waiting now to pour their treasures into the lap of prayer. Does not this lift prayer up to a high level when God is willing to repeat the biographies of his saints in us? When he is waiting to be gracious and to load us with his benefits? I will mention another truth which ought to make us pray, and that is this, that if we ask, God will give to us much more than we ask." And he concludes a couple lines later saying, "Asking is the rule of the kingdom." My goodness, that's so exciting to hear. And he believed it, and his congregation believed it. So, I don't think we have to wonder a whole lot why God did so much important work through he and his congregation. Sean McDowell: Craig, this verse you're referring to in John 15 is part of a larger teaching that Jesus has about the vine and the branches. He talks about cutting, pruning and abiding in him. Can you kind of give us ... just unpack a little bit what's going on in the context in which we find this passage? Craig Hazen: Yeah, this is really important. In fact, it's one of those things you need to encounter before we can really understand what this means. Because some people go, "Well, asking for anything and you're gonna get it? Does that mean I can ask for a new ski lodge in Aspen? A personal ski lodge in Aspen with five jacuzzis. And I say that and God's gotta give it to me? That sounds a little bit like the word-faith teachers." No, that's not what it means at all. The whole context is about fruit-bearing. It's about fruit-bearing. So it's us bearing the Lord's fruit. And the passage is basically saying if we are plugged in to him, if we remain or abide in him, and all of the good nourishment is being drawn up by the vine, and Jesus is the vine, and it's put through to the branches, we are the branches, then we will of necessity bear good fruit. And part of that is asking him. We ask him and he will let us bear good fruit. So it's really about serving him. But if we wanna serve him, and if we're abiding in him and his words are abiding in us, it seems to me that we can take this to the bank, that you really can ask for anything and he will give it to you. Sean McDowell: Okay. I remember reading this passage in college, in South Africa, on a basketball mission trip team, and reading the end of it going, "Wow, if I don't abide in him, the branches get cut off and destroyed." And I thought it was about losing salvation. You make a point that that's not what it's talking about. Craig Hazen: Yeah, you know, some scholars flirt with that. Most come around to the idea that there's a basic passage here and context that's talking about fruit-bearing in the name of Jesus. And so really the main point is that if you're not plugged into the vine, Jesus is the vine, if you're not plugged in, you're just not gonna be doing anything spiritually worthwhile. Sean McDowell: So fruit-bearing is just seeing people come to the Lord, seeing people grow, having an influence for the kingdom spiritually speaking. Craig Hazen: All kinds of kingdom-minded activities, including personal spiritual growth. Scott Rae: In our work, in our families, physically, even financially? Craig Hazen: Yes, absolutely. Now, I do make some distinctions about kind of the fruit-bearing prayers. But I think Jesus was trying to inculcate into his closest followers at the time. And it was a very intense time. This sermon of Jesus was actually taking place hours before he was dragged off to be crucified. So he was giving his most important messages to his closest followers at the time. And so he just wanted to make sure people understood what he was talking about. And he's really talking about doing important kingdom work. That's what they've been trained for three years, and he was about to release them to go do that, and he wanted to make sure that they were deeply plugged into him, drawing up all the spiritual nourishment and water and nutrients that the vine could provide so that they could bear the good fruit. So, I think the passage has mostly to do with that, but that doesn't exclude other kinds of prayers. I think it just enhances the other kinds of prayers because I see God answering these so regularly and so faithfully now that I've been focused on this that it's encouraged me to pray for other things, even things that aren't necessarily directly fruit-bearing. And I have lots of examples of those. Scott Rae: Let me go back, maybe this ties in a bit, because in Genesis one and two, when God gives his original command to Adam and Eve to be fruitful, multiply, fill the earth, subdue it and have dominion over it, the word be fruitful there, we often take that in be fruitful and multiply, we take those together meaning procreation. But the term fruitfulness there is actually an economic term, and it refers to vocational and economic fruitfulness that God commanded Adam and Eve to do. And the means to do that were built into the creation. Now, the multiply part, obviously procreation was important because Adam and Eve couldn't unlock all of that in creation simply by themselves, and they couldn't fulfill that mandate alone. But the idea of being fruitful from Genesis one, actually has maybe a little broader implication that we might originally have thought. And I wonder how that ties in to what you're suggesting about prayer in this way. Craig Hazen: Yeah, you know that is very helpful what you just said there. I was thinking about just sort of in personal terms. There's lots of prayers I make that I know just aren't really necessarily kingdom essential, they're not mission critical for the kingdom, lots of prayers I do. In fact, most of my prayers every day are along those lines. In fact, sometimes I look for fruit-bearing prayers to offer up because I just like to see those take place and I know the Lord is on them when I offer those. But by and large, if I'm just wanting to go out and work hard, "Lord, give me more work today," and I just wanna take that money and put it away in a 401(k) and I wanna see how big I can get that, you know, the Lord still might bless you with that. But honestly, that's not what Jesus is talking about here. Now, if you're gonna grow that bank account and you are gonna use it for mission critical fruit-bearing enterprises of the Lord, oh my, watch out, you can pray for lots of things and they will really come to pass. He might even increase those bank accounts a tremendous amount to see his work go forward. Scott Rae: So you do distinguish between kingdom requests and personal requests. Scott Rae: How do you know if the personal requests start to be narcissistic? Craig Hazen: Yeah, you're probably gonna have to ask a more spiritually enlightened fellow. I have the spiritual sensitivity of plankton. I just don't know sometimes. Let me give you this example though, just to talk about the difference. There's a distinction between fruit-bearing prayers and kind of regular run of the mill prayers, which are very valuable. I don't wanna diminish those at all. So, I use this example in the book. I've got a couple of daughters, and I remember when they were young and they wanted an American Girl doll. Well, I discovered those are really expensive. Scott Rae: Hard to come by, too. Craig Hazen: Yeah, I wasn't gonna run out and just get them one. I thought, "No, we've gotta have some economic lessons going on here. Maybe they can earn some of the money, something like that." Or maybe they wanted an ice cream and it was near dinner time. Well, I, as the father, have to evaluate how best to answer those. Is it gonna be yes, no, maybe, maybe later? Maybe there's other lessons that need to be learned. However, if those same girls were to come to me, not requesting an American Girl doll, but requesting, say, some money to go on a short-term mission trip to build an orphanage in Mexico, or they wanted to buy a new study Bible because they just wanna understand God's Word better, or even an SAT study book so they can really do well on their college entrance exams and things, oh my goodness, as a dad, I am so on that. I will go and I will beg, borrow and steal to have money to get into the hands of those kids because they wanna use it for something so wonderful. And I think that's how God looks on our activities. When he hears we're about his fruit-bearing, he is there and wants to provide us with the things that we need so that we can serve him in a better way. Sean McDowell: Now this is not an apologetics book, but you weave in a couple apologetics themes, let me ask you about. Early on you have a section on doubt and the evidence for God. Why did you choose to include that in a book on prayer? Craig Hazen: Well, it seemed to me that if you're having trouble understanding whether God really exists or not or is personal and interacts with you and so on, my goodness, if you're having trouble at that level, there's really no sense talking much about prayer because in your mind you might just be praying to the force or whatever you think might be out there. So I wanted to make it clear to people that God really does exist. The evidence is clear and it's compelling. It's also compelling that Jesus Christ is the Messiah and the Son of God, who died on a Roman cross and came back from the dead. These aren't just weird mystical feelings we have, but we can know these things to be true. From that platform, you can take this passage in John 15:7 much more seriously because God is there, he's personal, and he's ready to act. Sean McDowell: You also talk about how naturalism and how deeply this worldview seeped into the church and affects the way we pray. Will you talk about that a little bit? And then tell the story of Cojo, I thought it was so interesting. Craig Hazen: Yeah. I actually claimed that one of our reasons, probably the primary reason, we don't take John 15:7 seriously is because we are immersed in naturalism. We're immersed in naturalism. We don't know it because it's like the air we breathe. It's just the dominant worldview of our culture. And so what I mean by naturalism there, a simple definition would be just not ready to believe that supernatural things happen. You're just reluctant. And I think that generally characterizes our culture even inside the church. And so we read a passage like John 15:7, where there's this amazing supernatural promise, and we're a little bit shy about taking it seriously because of the naturalism that we live with. And so I think one thing we have to do in order to access fully this passage is to push up and get a deep breath of supernatural air if at all possible. And that's something great to pray for, "God, help me to get a deep breath of supernatural air." Some people don't know what naturalism is, so I use an example from a former student of mine. His name was Cojo. Cojo was from Ghana. And he came to the United States and did a master’s degree in apologetics, and then went back to Ghana to do ministry. Well, he was gone for maybe a decade or so. And he came back to Southern California, and I was very grateful that he stopped by Biola University to have a chat with me. And he was telling me about these marvelous ministry opportunities that he was having in Ghana. He got a chance to speak the gospel to the parliament in that country and all kinds of wonderful things. A lot of meetings out in the countryside, and he's telling me about how he's presenting the gospel and how a woman came in carrying a dead child and how the child was healed. And then he moved on to something else. I go, "Wait, Cojo, what in the world? Back the train up, I wanna hear what you're talking about there." And he says, "Yeah, well, this isn't all that unusual. A woman brings in a child and we pray for the child and the child was obviously dead and the child came back to life." Now, he was clear that that doesn't happen every time. So I go, "Okay, Cojo, help me understand this. Why do you think that we're not seeing that kind of thing here in North America?" And he says, "Well, that's easy." And he wouldn't tell me right away. He was kind of teasing me. He's like, "I can't believe you don't have the answer to that." And I go, "Come on, man, tell me what you think." And he finally says, "Well, you see, you have 911. You have 911." What he meant by that was we can pick up a phone and dial 911. Now, we might be praying while we're running for the phone. But we're gonna dial 911. And Cojo was very clear that that is the common grace of God toward you. You're very fortunate to have 911 and the emergency services can swoop in to help. He goes, "In Ghana, we don't have 911. So our first and really only recourse is to pray. And God doesn't do a miracle every time, but we pray more, and we expect more, and we see more." I thought that was a great illustration of how he has a more supernatural view of the world. He lives in a supernatural atmosphere a little more than we do because we have natural remedies for so many things that ail us. Scott Rae: What a story. Craig, one last question for you. Give us one really fearless prayer that you've prayed that was answered. Craig Hazen: You know, I don't think I have one really big one because what I've learned about this, as prayer is asking God, that I've grown in asking all the time, they're little things all the time throughout the day. And as my spiritual sight has grown, and this is probably the biggest thing for me is just being able to stand back and watch God move the chess pieces on the board in any given day to open up the thing I'm asking for. Even if it's not a fruit-bearing request. So these things are happening all the time. I think that the biggest crescendo for me was in grad school. I was in a hostile graduate program. It was a secular religious studies program, at a University of California for goodness sakes, and Jesus loving, Bible reading Christians like me don't go into a program like that. And so there was always challenges. But I think the Lord loved the fact that I was there and attempting to bear his fruit and do his work in such a hostile atmosphere. So he blessed me day by day there. I probably still hold the record for winning scholarship money at that university. One of my professors said, "We've never seen the likes of this anywhere." I would win $10,000 at a time. And this happened multiple times. I couldn't wait to go to the mailbox every day to see how the Lord is gonna bless me that day. He blessed me in many other ways, not just financially. You're not supposed to come out of grad school ... Well, you're supposed to come out of grad school in debt, not out of debt and with a down payment on a house. That's not how it's supposed to work. But the Lord loved that I was there and that I was trying to bear his fruit, and he wanted to show me that he was gonna be walking with me closely, giving me everything I need. Scott Rae: Hear, hear. That's great stuff, Craig. Thank you so much for your book, Fearless Prayer: Why We Don't Ask and Why We Should. I wanna recommend all our listeners, this is definitely a book you need to pick up and get really soon. We'll have a link for it in part of the announcement for our podcast. So Craig, thanks so much for being with us on this and for unpacking a lot of what you mean by this, because it's been really helpful today. So, we're very, very appreciative. Craig Hazen: My great pleasure. Thanks for having me. Scott Rae: This has been an episode of the podcast, “Think Biblically: Conversations on Faith and Culture.” To learn more about us and today's guest, Dr. Craig Hazen, and to find more episodes, go to biola.edu/thinkbiblically. That's biola.edu/thinkbiblically. If you enjoyed today's conversation, give us a rating on your podcast app and share it with a friend. Thanks so much for listening, and remember, think biblically about everything.